According to the Alzheimer’s Association, one in three seniors dies with some type of dementia. Alzheimer’s is the most common form of dementia, and is the sixth-leading cause of death in the United States. Both Alzheimer's and dementia remain somewhat mysterious. Doctors don’t fully understand what causes dementia, and people who don’t know someone with dementia may have little understanding of how dementia progresses. Some people mistakenly believe Alzheimer’s is the only type of dementia.Alzheimer’s is just one type of dementia. Dementia is a group of many different progressive disorders that damage neurons in the brain, undermining thinking, memory, and daily functioning. As dementia progresses, the symptoms of different types of dementia become more similar. A person may not be able to perform daily tasks, effectively communicate, or drive. In the early stages, however, there are many differences between types of dementia. Knowing the symptoms of dementia can help families get an accurate diagnosis, plan for the future, and choose the right treatments. Dementia isn’t really a disease; it’s a description of a group of symptoms. Many different diseases can cause dementia. Sometimes, the symptoms are very similar. For example, both Alzheimer’s and Lewy body dementia can affect memory in the early stages. There are also important differences. For example, Lewy body tends to cause behavioral changes that loved ones might mistake for mental illness; in Alzheimer’s, however, behavior changes happen much later in the disease. Different dementias attack different parts of the brain. Alzheimer’s targets the hippocampus, which plays a key role in memory. Frontotemporal dementias such as primary progressive aphasia attack the frontal and temporal lobes of the brain, affecting behavior and speech. Most family caregivers know that memory difficulties can warn of dementia. But memory difficulties aren’t the first or most significant symptom of all forms of dementia. Because dementia targets the brain, it can affect almost any aspect of functioning. It’s even possible for a person to simultaneously have two or more forms of dementia. Depression, anxiety, or other changes in mood. Many forms of dementia cause mood changes. Sometimes mental health conditions may cause dementia-like symptoms, though, so an accurate diagnosis is key. Changes in behavior. Look for aggression, impulsive risk-taking, unusual spending habits, or loss of interest in once-beloved activities. Changes in driving habits. Has your loved one stopped paying attention behind the wheel or begun driving more aggressively? Are there dents on the car? Does your loved one keep getting tickets? Neglecting tasks of daily living such as eating, bathing, or combing hair. A home that is increasingly in disarray. Nervous behavior, such as picking skin, twitching, pacing, or squeezing things. Signs of incontinence, such as smelling bad or not regularly going to the bathroom. The right care for a loved one with dementia depends on how severe their symptoms are. Some seniors are able to continue living independently with help. Others need 24/7 in-home care. 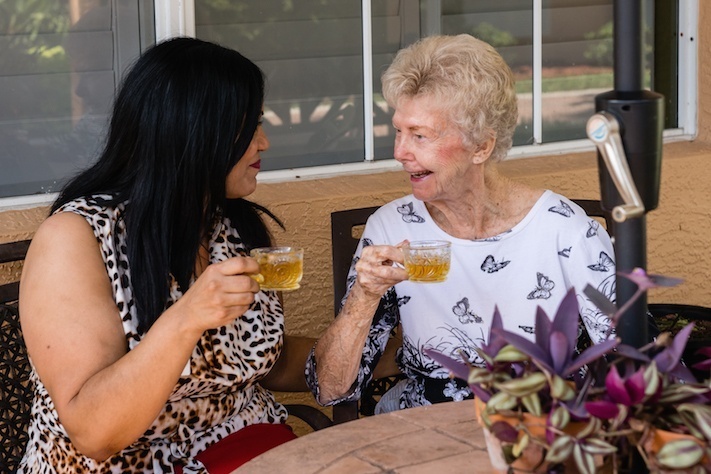 In most cases, moving to a senior living community will offer your loved one help when they need it, as well as many opportunities to make new friends, learn new things, and participate in community life. Senior living communities understand dementia, so they tailor their activities to the needs and abilities of the residents they serve. Dementia can progress very slowly or very quickly, but in most people, it will progress. So it’s important to choose flexible care that allows your loved one to get more help as their disease gets worse. Many families choose a senior living community that offers assisted living and memory care. To learn more about your options for supporting your loved one, download our free e-book, The Caregiver’s Complete Guide to Alzheimer’s and Dementia Care.